So Many Euros - Deluxe Edition is a digital collector´s box for your Euro coins. Since January 1st 2002 the Euro is the legal tender in many European countries. Apart from the 12 countries Belgium, Germany, Finland, France, Greece, Ireland, Italy, Luxemburg, the Netherlands, Austria, Portugal and Spain also Monaco, San Marino and the Vatican have invented Euro coins with different national reverses. Since 2007 there are also Euro coins from Slovenia, since 2008 from Malta and Cyprus and since 2009 from Slovakia. Although for some of these coins (eg from the vatican) it is nearly impossible to find them in your purse, collecting the different Euro coins has become an interesting hobby for many people. With so many different coins (200 from the 19 countries) it is quite difficult to determine which coin already belongs to one´s collection. And if you make a distinction between the different stamping years and places there are soon more than 1,660 variants. So Many Euros - Deluxe Edition helps you to keep track of your collection. Pictures of all the 280 Euro coins will support you while trying to identify a given coin. For every coin there is information available about the motive and the number of copies with respect to the different variants. Of course you can save the number of copies you own for every coin so that it can be seen at a glance which coins are missing or which can be swapped. Using the extensive reporting function “Search” and “Offer” lists can be created. These can easily be copied into e-mails for exchange partners. It is also possible to generate HTML pages for publish on your homepage or lists in BBCode for internet forums. So Many Euros - Deluxe Edition is easy to handle due to its clearly structured graphical user interface. Within some minutes you will have all your existing coins registered. Programm language is English, German, Dutch, French, Italian, Spanish, Portuguese, Finnish, Polish, Slovak or Russian. There is extensive background information included covering the Euro history, countries, coins, mints and a map. Using a configuration dialog you may choose which countries to display. Larger pictures and more detailed motive descriptions are available for all coins. Using a table view it is easy to compare the number of copies issued and the number in your collection. Perhaps you own a really rare one? This version also covers all of the new 2 Euro commemorative coins (about 80) including pictures, number of copies and motive descriptions! Of course the common issues “Treaty of Rome” (2007) and “10 years of EMU” (2009) are also covered. To identify complete sets there is a new feature: A coloured flag is displayed on the country or coin tabs if this set is already part of your collection. How much money could you spend if you decide to give away all the coins in your collection or only some for swapping? Use the nominal value function to determine the right amount. In the report area there is a print function for text lists available. In order to keep track with all the functions there comes an extensive help function with this version including detailed descriptions for all program features. Last but not least: Future issues of new coins are no problem. There is place for different sets (eg Vacant Papal See from the Vatican) as well as new countries joining the Euro are. The coin data are updated regularly. And these updates are for free! You want to know more about the features of this software? Take a look at some screenshots on the features page. Version 1.8.0 of So Many Euros - Deluxe Edition was just released. This version includes a lot of new coins and functions. Read here all about the new features. For any questions about the software feel free to contact me via the homepage, e-mail or the Euro Coins Collection Network. 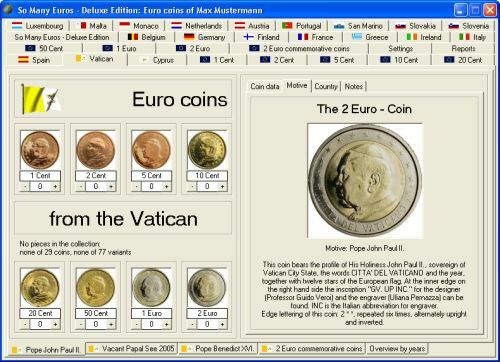 the software is focussed on the 1 Cent to 2 Euro and 2 Euro commemorative coins. Other commemorative coins as well as banknotes are not supported. But thanks for your comment anyway. Is there any way to upload photos of the commemorative Euro coins,such as the 15 Euros from Ireland? What about sections for the Euro banknotes,as there are also collectors of those as well?